Sometimes upholstery buttons may fall off, it is very common and normal. Usually wear and tear or maybe a faulty button may cause it to come off. 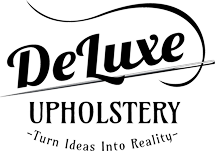 At deluxe upholstery if you can keep your button after it comes off and give us a call we might be able to fix it on the spot without having to take your furniture away to repair. Take a look this velvet chair we fixed on the spot. Some before and after snaps.